The next release on Superfreq is the first EP from new studio duo East LA Tek, aka label boss Mr C and Detroit born DJ, producer, and artist Noël Jackson. 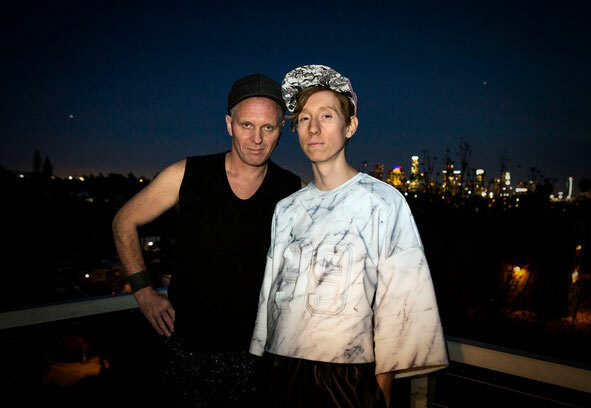 Mr C has a rich history that takes in many DJ and production accolades amongst other things, whilst the now LA-based Noël runs his own label Hypertone. In production terms he has lots coming up this year, and has remixed the likes of Julie Marghilano, Miss Jools, Inxec in the past, as well as having his music used on Derrick May & Jimmy Edgar's ‘We Love Detroit’ compilation. Made using proper studio gear such as Nord Lead 2, Moog bass, a Roland 303, secret analogue drums and other nice goodies, the pair take inspiration from the fact they are both foreigners making LA their home and the results make for some hugely expressive and inventive sounds ready for serious dancefloor action. Up first is ‘Back Alley’, a tune as seedy and shady as the title suggests, with its flickering hi hats, classic cowbell pings and gritty, grubby bassline. Acid splashes into the mix at the mid point, taking the track to another level entirely. ‘Addictive Box’ is another low down cut with slicing hi hats and hollow cowbells, plenty of corrugated bassline action and, later on, some expansive synth action. It’s both tight and kinetic yet skyward and spacey. Next up, ‘She’s An Eleven’ picks up the pace and dips its toe into firmer techno territory with slapping kicks hurrying along beneath a microcosm of little alien sounds, squeals and effects. Again a well-crafted bassline is the main focus as it rides up and down the scale. ‘Come Again’ pulls a different trick entirely, leaning on a much more sleazy, ghetto-tech rhythm and imbuing it with skittish percussion, electro flourishes and vintage sounding melody lines. The EP’s out 30 May on Superfreq.